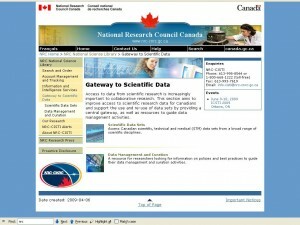 National Research Council Canada Institute for Scientific and Technical Information, NRC-CISTI launches Gateway to Scientific Data. This is very exciting news. The Gateway includes data, data management and curation content. Scientific data generated during the research process can be an important resource for researchers, but only if it is accessible and usable. Thanks to a new initiative of the NRC Canada Institute for Scientific and Technical Information (NRC-CISTI) researchers now have a central gateway for easier access to Canadian scientific, technical and medical (STM) data sets and other important data repositories. Along with links to data sets, the new Gateway provides links to selected policies and best practices guiding data management and curation activities in Canada. It also includes links to selected journals and upcoming conferences and meetings.